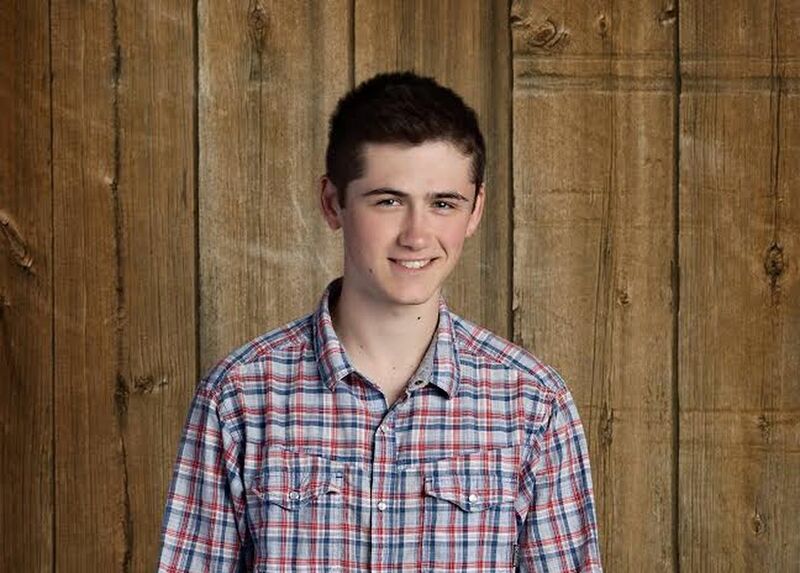 Remains believed to be those of missing Palmer teen David Grunwald were found Friday afternoon, and a 16-year-old has been charged with his murder and kidnapping, Alaska State Troopers said Saturday. Alaska State Troopers said Saturday that remains believed to be those of Grunwald were found in the Knik River Road area on Friday afternoon. The remains have been sent to the State Medical Examiner in Anchorage for identity confirmation, and to determine the cause of death, troopers said. Investigations resulted in the arrest of 16-year-old Erick Almandinger, a Palmer teenager who is being charged as an adult with murder in the first degree and kidnapping charges, troopers said in a summary posted online Saturday. Almandinger appeared in state court in Palmer Saturday morning, according to online court records. "Others involved in this incident have been identified but have not been charged as of yet," the trooper report says. Troopers spokesperson Tim DeSpain declined to provide further information in the case, citing an ongoing investigation. Grunwald, 16, went missing in mid-November. He dropped off his girlfriend near Butte the night of Nov. 13. His parents told Alaska Dispatch News last week they started getting worried about him when he didn't return home by about 9:30 p.m. Troopers say they found his 1995 Ford Bronco around noon the next day, burned to its frame up a dirt track at the base of the Talkeetna Mountains north of Wasilla. 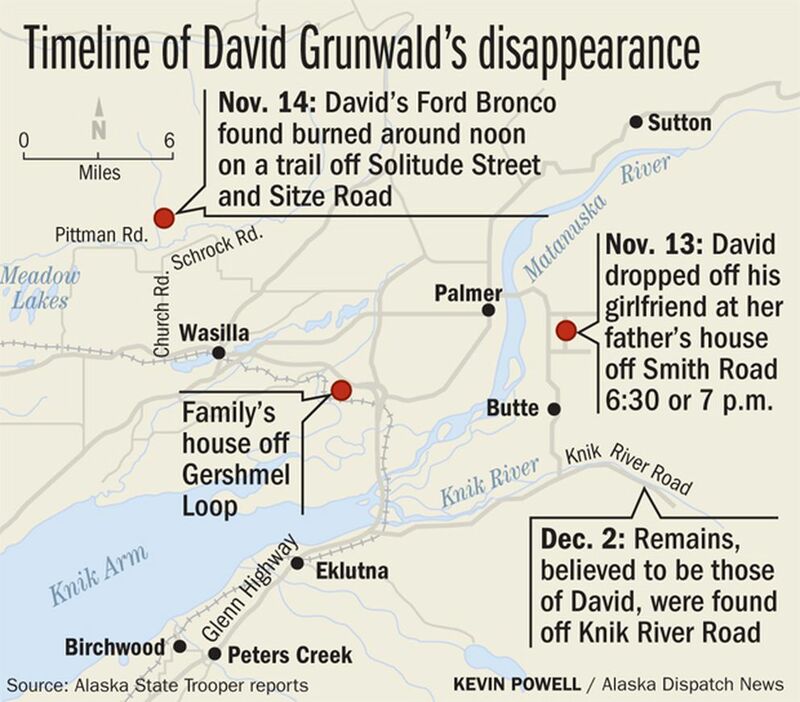 The Bronco turned up about 21 miles from the house on Smith Road where David dropped off his girlfriend, according to a route search by his father, Ben Grunwald, and a buddy. Also, at least one cellphone "ping" from David's phone was tracked to a tower near Palmer in the hours after he went missing. Hundreds of searchers combed a wide area — Palmer, Jim Creek near Butte, the trail up Bald Mountain Ridge where the Bronco turned up. They found nothing. Private investigator Brenda Paradise, who has been donating the work of her nonprofit Guardian Search and Investigations to the family, said Saturday the area where the remains were found was one of the locations a search-planning computer program had keyed in on. "This was absolutely in the areas where we have been searching. We've had dogs out in several locations this week but the snow just made it really difficult to find anything, to do any searching," Paradise said. Paradise said she won't close her own investigation until the remains are confirmed as Grunwald's. "I'm going to urge the community to keep calling in, call that tip line, that tip line is there," Paradise said. "This is not the end, this is just the beginning. And what I mean by that is this is time for answers and closure for the family." Anyone with information can anonymously leave a message at the Guardian Search and Investigations tip line 907-290-8999. In addition to the tip line, anyone with information on the case can call troopers at 907-269-5497 or 800-478-9333, or Crime Stoppers at 907-745-3333. A candlelight vigil was planned for 7 p.m. Saturday at the Palmer Train Depot.